I still haven't gotten a chance to go back to work on one of my games. I'm on another trip for work this week. But I did learn something new related to today's comic. While it doesn't have any special features, it does have a piece of paper on the ground with writing on it. The writing is skewed to show perspective. This is something that I hadn't been able to figure out before today - how to make a perspective transformation in Inkscape. Here's how to do it. First, get whatever object you want to transform. It can be text or a picture of something, but you have to turn it into a path first. You can do that by using the Path - Object to Path menu option. In this example, I'll transform one of my frog images. It is made up of lots of paths, all in a group. That's ok. To perform the skew, draw another path around the object in the shape that you want it to look like in the end. Start in the lower left corner and draw the line clockwise. After you have the shape outlined by the new path, select the shape to be transformed first and the path second (Shift+click). Then use the menu option Extensions - Modify Path - Perspective. It takes a few seconds, but should look like this after it runs. You can delete the outline path if you want. That's how I made the text on the "landing page" look like it does. I'm always happy when I learn something new. 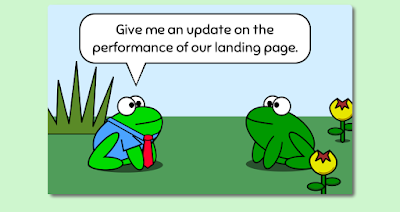 I'm also happy when you read my frog comics. Are There Still Tech Books?